You may represent yourself in any Virginia divorce. This article discusses the package assembled by the Fairfax Circuit Suit containing all documents you may need to file in such divorces. The documents discussed here are available on the official website of Fairfax County, Virginia. Virginia Pro Se Divorce Package Step 1: The first form in the package is the complaint for divorce you should complete if you have lived separately for at least six months. The second form is the complaint which should be filed if you have lived apart for a year or longer. Virginia Pro Se Divorce Package Step 2: The next document is a VS-4 form which must be filled out and submitted along with your complaint for statistical purposes. 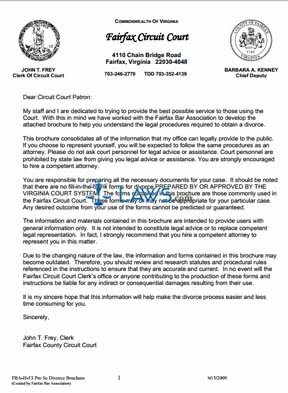 Virginia Pro Se Divorce Package Step 3: The next document is a Fairfax County Domestic Case Coversheet, which provides some basic information about the parties involved in the divorce and the type of rulings you are requesting. Virginia Pro Se Divorce Package Step 4: The next document is a document which can be filed by your spouse to formally waive their right to contest the terms of your complaint, as well as to waive their right to be present during court rulings. Virginia Pro Se Divorce Package Step 5: Forms 5A through 5F are various forms of final decree of divorce. These can be completed in advance for a judge's approval. The forms differ depending on the length of the separation, whether alimony or child support is sought, and whether there is a separation agreement. Virginia Pro Se Divorce Package Step 6: The next document is a light pink private addendum for confidential information that will not become part of the public record. Virginia Pro Se Divorce Package Step 7: The seventh and eighth documents can be filed if you seek an ore tenus hearing to request that a separation agreement be approved. Virginia Pro Se Divorce Package Step 8: The last document should only be completed if you wish for a name change once your divorce has been finalized.